Our range of products include laser land leveler and heavy duty land leveller. 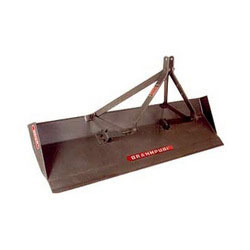 The BRAHMPURI Heavy duty Land Leveller is a simple and rugged Implement which is directly fitted to the tractor. Relying on our wide experience and skilled workforce, we are considered to be the most reputed manufacturers and exporters of Heavy Duty Land Leveller. Our offered range is manufactured using best quality materials as per the norms and standards set by the requisite industry. These are available with us in various specifications. This is widely used in agriculture sector. Heavy Duty Land Leveller is available at very affordable price rang. The leveller is available in 6' to 8' width. MADE OUT FROM MS FLAT 50 X12 MM.